Recently I’ve been dealing with a very accident prone little toddler (poor thing!). So this week’s video is about how a simple thing such as a carseat can help your child deal with painful accidents and medical procedures such as vaccinations, blood tests, etc. I know – it seems strange, but this is about how a seemingly innocuous thing can help your child to release much of their feelings around pain, fear and upset. 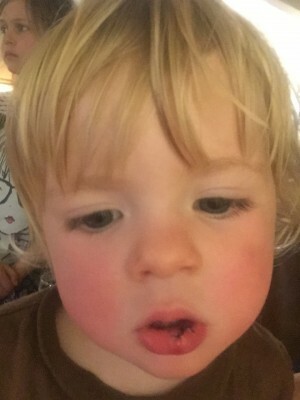 In the case of my little boy – he had a fall and split his lip so badly that it needed stitches. 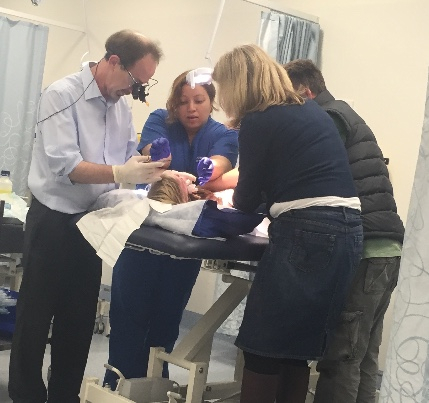 3 of us had to restrain him whilst the doctor injected local anaesthetic and then put in 3 stitches. It was horrible, and George howled. But what was great, was that I felt confident knowing that I had these amazing tools to help him deal with the pain and trauma of it. And so I’d love for you to also feel confident and empowered in such difficult times with your kids.ids. So, back to the car seat….. Immediately after the procedure, I held George in my lap while he cried. I wanted him to cry as much as he needed to, whilst receiving as much love and connection as possible from me. After a couple of minutes he stopped, and waved happily to everyone as we left. Over the next few days he became more & more out of sorts and his sleep was unsettled. 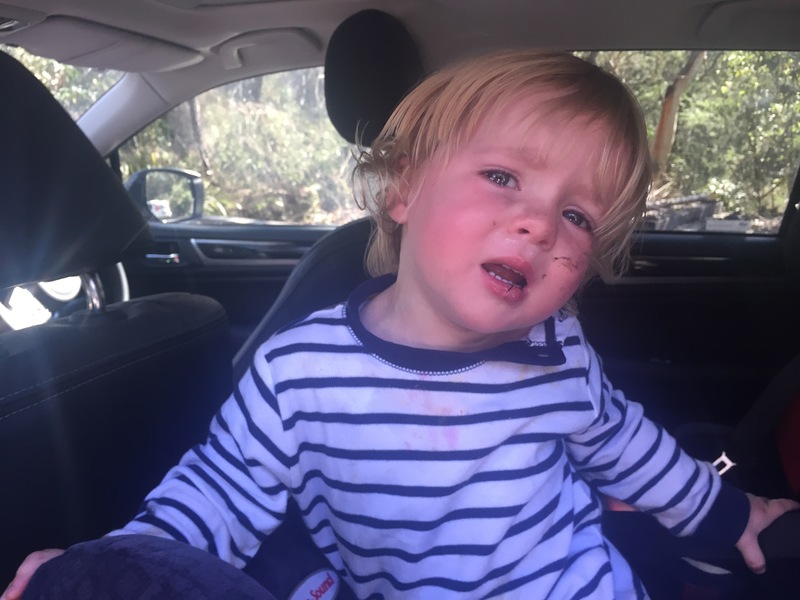 And on the 3rd day, after a lovely morning at a park, the time finally came for him to let it all out – when he had a massive tantrum about going into his car seat. This seemingly insignificant event (going in the car) brought on a huge reaction, disproportionate to the actual issue of going into his seat. He screamed and cried and arched his back – there was no way I was getting him in! And this is where the healing could really happen. George had something tangible he could react to – something he could physically push against, that helped him tap into the feelings generated by the injury, and which enabled him to finally release them. Sometimes we need something like this to react against. It’s why we snap at our partner at the end of a hard day, or why our children become distraught if their biscuit is broken. The build up of feelings suddenly explodes out of us and we become irrational and very upset. And it’s why it’s so important that our partner or parent recognises this for what it is – a clear sign of an accumulation of upset feelings that need to come out. So how can we best help our children in this situation? We stay, and we listen. We empathise and offer our connection. We also maintain the request or limit in a loving way so that our children can access and release their feelings through crying and laughing. I know it can seem counter-intuitive, but we want them to have a really good cry! The key is that they cry and tantrum WITH us. Not on their own. In the case of George and the carseat, we stayed within the car together. And when he would stop crying after a while, I would gently say “It’s time to get in the car seat” or “Let’s put on your straps now” – not with the immediate intention of putting him in the carseat with the straps on, but so that the mere suggestion of doing so would help to bring up his upset feelings, particularly about being forcibly restrained when he had his stitches. Staying with him around the car seat allowed him to experience the feelings in a safe way – I was with him, and I wasn’t overpowering him. I was offering him lots of empathy and understanding throughout. The whole process lasted about 1.5hours (I know, ages!!!). He didn’t cry the whole time, as we also chatted and laughed. Laughter is also a fantastic way to release hurt, so he oscillated between crying and laughing. What was important was the connection we had throughout. In the end, he calmly went into his seat and we went home. It made such a HUGE difference as he became much happier again and his sleep improved. Plus he was fine about going into his seat again the next time we went in the car. It was brilliant…until we found a tick on his head, and had to restrain him again to take it out! And then, sure enough, we had another car seat incident a day or so later…. So if your child hurts themselves or has painful medical procedure such as stitches or vaccination, allow them to cry freely in your arms at the time of the hurt. And then notice any irrational, explosive behaviour in the days afterwards. If they have a tantrum, you can see it as a catalyst for helping them to heal. Stay with them and allow the feelings to flow out of them. And then notice the difference afterwards! It’s horrible seeing our children in pain, but it’s fantastic to know that we can help them to effectively offload their fear and upset, so they don’t carry that around with them in the future. Here’s to an injury-free week!